1. For the croutons, place the torn bread pieces on a rimmed sheet pan. Toss them with the olive oil and a generous pinch of salt and a sprinkle of garlic powder. Bake for 10 minutes in preheated 350 degree F. oven, stirring once. Turn off the oven and allow the croutons to continue to dry out in the oven while you prepare the rest of the soup. 2. In a large stock pot on medium heat, warm up the butter and olive oil together. Add the onion, carrots, celery, and 1 teaspoon salt. Cook for about 10 minutes, until the onions are translucent and the carrots become tender. 3. Add the oregano, pepper, bay leaf, and garlic. Cook for 1 minute, until the garlic becomes fragrant. Add the vegetable stock and tomatoes. Bring this to a boil. Simmer on low with a lid partially covered for 30 minutes. 4. Blend the soup with an immersion blender until you have a chunky/smooth consistency. (You can also do this in smaller batches in a blender.) Lower the heat to its lowest setting and pour in the whole milk and heavy cream. (You may use all whole milk or half and half. Do not use skim or low fat milk!) Stir in the parmesan cheese until it melts. Add the fresh basil. 5. Season the soup with salt and pepper to taste. 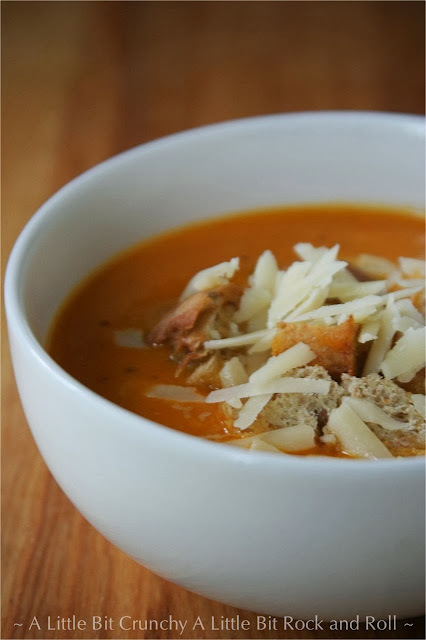 Serve the soup topped with croutons and additional parmesan cheese. We also enjoy our soup with hemp seeds for additional protein. This is a favorite with with the kids, who fight over who gets to take the left-overs in a thermos for lunch the next day. I use tomatoes I cooked, juiced, and froze from last summer, and basil I froze from summer too. Excellent recipe.